Today during the Final Fantasy 14 Fan Fest event in Paris, Final Fantasy 14 director Naoki Yoshida and localization and translation director Michael-Christopher Koji Fox took to the stage to announce that Shadowbringers will have multiple new jobs. Blue Mage came as a mid-patch addition to Final Fantasy 14, but the first new job for the expansion is Gunbreaker. The Gunbreaker wields a wicked gunblade like Final Fantasy 8's Squall Leonhart. 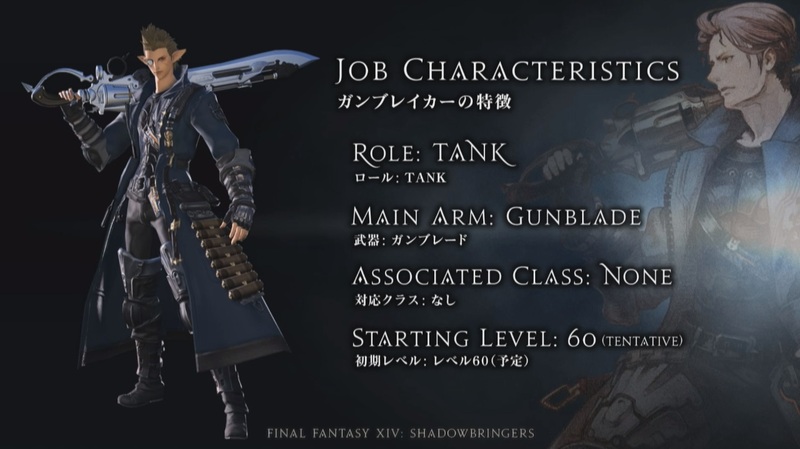 Gunbreaker is, surprisingly, a Tank role for Final Fantasy, joining Dark Knight, Paladin, and Warrior. Like in Final Fantasy 8, the Gunbreaker will slash at enemies, pulling the trigger to deal additional timed damage. Players can unlock Gunbreaker by purchasing Shadowbringers and leveling at least one character to level 60. Square Enix is currently planning to have the job unlock quest in Gridania, allowing players who have reached 60 to leave through the new expansion as a gunbreaker. Returning character Thancred, who was previously a Rogue, has now upgraded his swag and become a Gunbreaker.